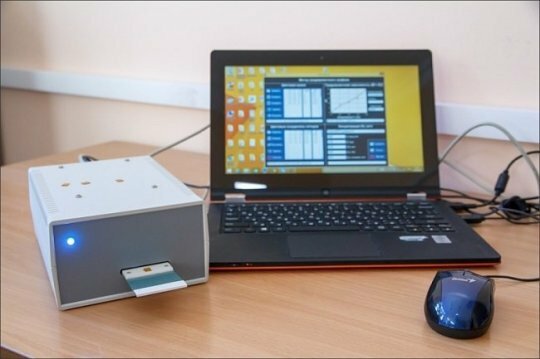 Scientists from Tomsk Polytechnic University have developed a device for the rapid analysis of liquids on the content of hazardous substances — such as heavy metals. Polytechnicers use a method based on polymer optodes — very small plastic matrices that can be made sensitive to specific substances by means of special reagents. The matrices change color and its intensity depending on the concentration of the substance. The device is mobile, can carry out analysis in situ even at low temperatures, and its cost is many times less than the price of a spectrophotometer — the most used device for chemical analysis. "The device is based on polymethacrylate sensors — transparent pieces of plastic with thickness of 1 mm and a size of 3×3 mm. The pores of matrices serve as receptacles, where various chemical reactions can undergo. If a matrix is handled with a special reagent it becomes an optode sensitive to a particular substance. We plunge this optode into the water to test it or simply drip a few drops on it, and it changes its color. Hence, there is a required element. Sergey Muravyov, the scientific supervisor of the project, head of the TPU International Laboratory Advanced Measurements, says: "The more intense the color is, the higher is the concentration of the substance,"
For example, if water contains silver optode turns purple-red. According to the scientist, such a method can detect substances even at very low concentrations in water. "You dip optode into the water and then load it into the device analyzer. There a special electronic device receives optical signal and converts it into an electric three-channel RGB-signal. After this signal processing the device outputs the data in digital form on the concentration of the searched substance. The analysis takes place immediately," the project manager says. This method allows the detection of almost all metals, organic materials and various pharmacological agents in water. "Our method works with those substances with which interaction leads to color change. Indeed, this is not the whole range of substances. But universal methods do not exist. Today, the most widely used method for chemical analysis is spectrophotometry. A modern spectrophotometer costs about 500 thousand rubles, and it is a bulky stationary device. Our device can achieve the same quality of measurements, but it is compact and can cost about 30 thousand rubles at the market placement," — he says. Such a device for rapid analysis is useful for environmental and related services personnel of industrial enterprises. For example, oil companies can use the device for the determination of the tracers in the drilling fluid. "To date, we have prepared a prototype device, — Sergey Muravyov says. — Now we have set ourselves the task to use this method for a multi-component analysis. The fact is that the reagents that configure optode to a definite substance are sensitive to a few substances." The above post is reprinted from materials provided by Tomsk Polytechnic University (TPU). Note: Content may be edited for style and length.